The Milwaukee 2429-21XC M12 Sub-Compact Band Saw is the most compact and lightest weight cordless band saw on the market. At less than half the weight and size compared to a traditional deep cut band saw, the M12 Band Saw provides one-handed power and portability to electricians, maintenance professionals, and other users cutting small diameter materials. The M12 Band Saw weighs only 6.75 lbs and 12 in. in length, making it ideal for overhead or one-handed cutting applications. This powerful saw can cut through 3/4 in. 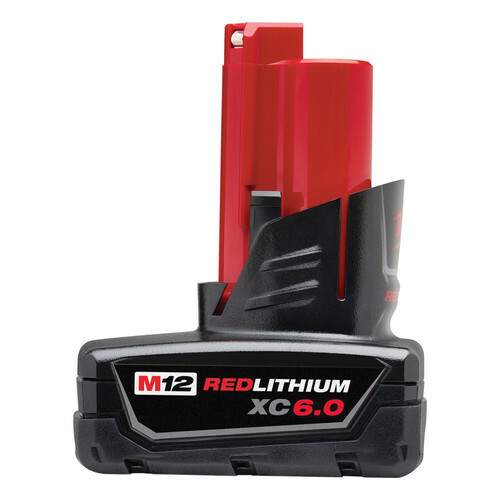 EMT in only 3 seconds, and will deliver over 150 cuts per charge with the included M12 REDLITHIUM XC High Capacity battery. With a 1-5/8 in. x 1-5/8 in. cut capacity and low vibration, the M12 Band Saw performs clean cuts on the most common small diameter metal cutting applications. The M12 Band Saw also features a dual-latching lower guard that covers the blade outside the active cutting area, addressing OSHA guarding requirements and making the tool suitable for one-handed use. The tool also includes a variable speed trigger, and LED light. The M12 Sub-Compact Cordless band saw should be used only with Milwaukee 48-39-0572 Sub-Compact Portable Band Saw Blades. Little brother to my full sized band saw. I usually have my full sized Deep Cut band-saw clamped in a jig to act as a chop saw or bolted to my work bench as a mini band saw. The little guy here is just perfect for those times when you need some thing cut quickly or a one off cut. The big saw I usually reserve for heavy stuff or repeated cuts for a project. This little one is great for small pipe, bolts, etc. I love these 12 volt as easy to use especially over head one handed! Ideal solution for cutting small conduits and stock measuring less than 1-3/4 inches. Lightweight and easy to use. I bought this for a metal baluster project at home. I already have the batteries for the M12 system. The saw is simple and works great on the metal balusters. It will work great on thin wall conduit too up to a certain size. I can't saw how heavy duty it is but it works great for what I'm using it work and it's not heavy duty work. I wish I had had this when i did the metal railing on my deck the other year instead of a chop saw. It's a nice clean cutting tool. I found one of these at a jobsite three years ago. I borrowed it to cut some Unistrut. I fell in love then and there, and had to buy my own. Put simply, this tool is The. Cats. Pajamas. It is well balanced and easy to control one handed standing on a ladder, which you simply can't do with larger saws. The iron rail sight makes it fairly easy to cut square. Using the XC batteries gives it longevity better than any tool this size doing metal work ever has. It's good for up to 1-1/2 GRS or PVC conduit. Again I can't stress enough the ease of use being able to stabilize work with a free hand while sawing. We recently had to remove several 300 foot runs of old fiber optic cable in innerduct that wound around inside a building. Using this to cut the work into manageable segments in literally two seconds saved HUGE amounts of time, and it even went straight through the Kevlar fiber in the cable itself without stopping. Not to mention using this is far more stable than using a reciprocating saw. Every tech and engineer I've handed this to has grunted like Tim Allen and declared "Tool of the Year" and "I'm getting one of these." Love this little saw! Have had it about 2 weeks and have cut 1/2, 3/4, and 1” EMT. Really did not notice a cutting speed difference from my Milwaukee corded band saw, and the one handed operation and light weight is awesome. Also cut some 1” rigid and some gas pipe, it did it well just takes a few seconds. Would use it for a couple cuts of rigid but if I was cutting all day I would use the corded. Amazing for remodel work as I have taken it into attics and crawl spaces were only a sawzall was possible before. Also +1 to CPO as the Milwaukee plastic case was damaged on arrival, one call and they had a new case sent out to me! I like the variable speed, the bottom is covered so you don't cut your hands. The only thing that worries me is that the blade wheels are made of plastic, Time will tell how well this holds up. Is the battery offered an extra battery or just an upgrade? BEST ANSWER: This package that I bought came with 1 extended capacity 4AH battery. Extra. it is the same battery that comes with it.